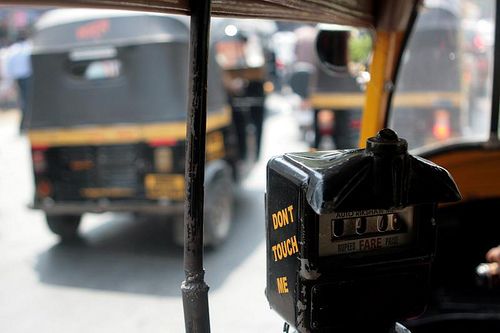 The Meter Jam campaign started as a protest against Mumbai cabbies who overcharge passengers. Photo by Mayank Lahiri. There have been more developments in India’s Meter Jam campaign, which we’ve been following for the past two months. The boycott of taxis and auto-rickshaws first began in mid-August, mostly as a protest against drivers, who, especially in Mumbai, frequently refuse potential passengers and overcharge by using tampered meters. More than 40,000 people participated in the strike organized by three advertising professionals. The campaign organizers used social media to generate a groundswell of support among urban dwellers voicing discontent for the largely unregulated drivers. The campaign led to some immediate minor victories, including an increase in fines and arrests of drivers who refuse fares, a focus on monitoring areas where much of the grievances occur, and work with unions to ensure drivers are following the rules. Now, as the campaign evolves, “jammers” are calling for more direct action from the police and other city officials. We went to various stations, including Andheri and Mulund, and even colleges . . . Our aim was to make people aware, and some percentage of people supported us. We distributed pamphlets explaining why we were doing this and why one should support it. Once we explained our purpose, citizens seemed interested in the campaign, but most wanted results. The lack of participation may be in part because of some action from the Indian government. The Regional Transport Office (RTOs) launched share-an-auto rickshaw services between Kurla, Mulund, and Mankhurd—all suburbs or areas of Mumbai west of the central district. The service will take the commuters to and from railway stations in the suburbs, Transport Minister Radhakrishna Vikhe-Patil says. Fares for travelling by auto rickshaw will be as low as Rs 5 per person. The eastern suburbs will have the new service as well including Bandra and Andheri with 100 routes planned in all. Some of the shuttles will move east to west and be especially helpful for rush-hour commuters who are usually at the whim of some auto-rickshaw drivers’ price gouging. Regulation will be in place to ensure taxi drivers follow the new rules. At train and bus stations, drivers are expected to maintain discipline, stay in queues, “drive out of the station area without obstructing movements of passer-bys and avoid traffic snarls.” Officials said drivers will face fines or suspended licenses for errant behavior. Also, the new service will have drivers carry three people instead of only one passenger. Will There Be a Meter Jam 3? [Citizens] do not want to say ‘no’ to taxis and autos but want their complaints to be dealt with by the police and road transport authorities. [They] want someone to look into the matter and find out what happens after someone files a complaint, as in most cases, there’s no follow-up. Therefore, instead of a Meter Jam 3, we will try and work out a sustainable platform — an intermediary between the road transport authorities, traffic police and citizens — to get updates on citizens’ complaints. The campaign was an important expression of citizen disapproval with mobility in Mumbai, but it also shows the city’s dependence on cars. Mumbai is a city that should support integrated transit: well-planned and inclusive metro rail, buses, congestion pricing, bike-share programs, and land use patterns that support the sustainability, health and social equity of this India megacity.